Good news for taxpayers , now you can check status of Income Tax Refund with click of mouse! As shown in form given below, you can check refund status Assessment year 2006-07 to AY 2016-17 by entering your PAN and selection of relevant assessment year.The Scheme is now extended to all over India and all refund issued either online or offline can be checked other area also. RTGS / NECS: To enable credit of refund directly to the bank account, Taxpayer's Bank A/c (at least 10 digits), IFSC code of bank branch is mandatory. Income Tax refunds can be hugely important to all the taxpayers as well as the private investors, provided that the value of that guaranteed refund will be revealed to them. Mainly, the taxpayers are pushing for augmented disclosure of that tax refund and the connected value that they create generally. Thanks. My pan no is AMLPR0842E, My return filed on 26/07/2011, for A/Y 2011-12, But up to now I have not received my refund, so please check & send me immediately.my date of birth 05/01/1968. MY PAN NO.AAUPB7231N,MY RETURN WAS FILED FOR A/Y 2009-2010, BUT UP TO NOW I HAVE NOT RECIEVED MY REFUND, SO PLEASE CHECK & SEND ME IMMEDIATELY. MY DATE OF BIRTH 12/10/1951. but up to now i have not yet received my Refund,so please check & send me as early as possible.my date of birth is 31/07/1962. My pan no is AZHPG7322D, My return filed on 28/07/2011, for A/Y 2011-12, But up to now I have not received my refund, so please check & send me immediately.my date of birth 04/06/1987. my pan no is ALXPT5331P, my return filed on july 2011 but up to now i have not received my refund, so please check and send me immediately. my date of birth 03-03-1987. My pan no is AKYPJ2390N, My return filed on 08/07/2011, for A/Y 2011-12, But up to now I have not received my refund, so please check & send me immediately.my date of birth 14/10/1976. My pan no is AKYPJ2390N, My return filed on 08/07/2011, for A/Y 2010-11, But up to now I have not received my refund, so please check & send me immediately.my date of birth 14/10/1976. Please contact me @ 7209841741 for Income Tax related Problem's solution. MY REFUND ORDER WAS RECEIVED BY ME BUT ITS DATE WAS EXPIRED SO I SENT BACK THE SAME TO CPC CENTRE, BANGLOUR BUT STILL AM WAITING FOR MY REFUND CHEGUE.MY PAN NO IS AABHN5441B .THE A/Y UNDER QUESTION IS 2011-2012. Please contact me @ 9825168401 for Income Tax related Problem's solution. mY pAN NO.AIEPG9223G FOR THE ASSESSMENT YEAR 2010-2011, TILL DATE I HAVE NOT RECEIVED TAX REFUND AMOUNT NOT YET DEPOSITED IN MY BANK ACCOUNT. MY SELF VINAY K PANDEY having PAN NO. ANLPP6096R has still not received my return of financial year 2011-12.On status checking it is intimating that the address does not exist,while i am staying on the same place for last 5 years. plz. look into the matter and oblige me. MY REFUND ORDER NO: 559080 DATED 12.05.2011 WAS RECEIVED BY ME BUT ITS DATE WAS EXPIRED SO I SENT BACK THE SAME TO CPC CENTRE, BANGLOUR BUT STILL AM WAITING FOR MY REFUND CHEGUE.MY PAN NO IS ACHPC4058M, A.Y:2010-11. You should complaint to ITO TDS under who's jurisdiction school falls and send complaints copy to school also. I have not received 2009-2010 & 2010-2011 refund. pl send the my refund. Birth date : 08.06.1967 My Id : rajeshpatel967@yahoo.co.in. My address completed to change for the same. My pan no is AFWPB2012G, My return filed for A/Y 2011-12, But up to now I have not received my refund, so please check & send me immediately. REASON QUOTED FOR NON ISSUE OF CHEQUE Others - Paper refund was cancelled or electronic credit rejected by the bank of the assessee with the reasons others. Contact your assessing officer for fresh release of refund. AS ON DATE 31 JULY 2012 I HAVE NOT RECIVED MY CHEQUE SO FAR. TO WHOM SHOULD I CONTACT TO GET MY REFUND. My pan no is ANCPK0037C, My return filed for A/Y 2008-09, 2009-10, 2010-11 & 2011-12 INCOMPLETE REFUND But up to now I have not received my refund, so please check & send me immediately. I file my ITR on 09th may'12 & IT department send me acknowlegement no. also but refund is yet not send by IT department. So kindly help me as possible. Sir,my PAN NO is ARLPS6266L MY INCOME TAX REFUND OF 2010-11 has not come till now pleas arrange the refund. My pan no is AGYPM9106B, My return filed for A/Y 2011-12, But up to now I have not received my refund, so please check & send me immediately. My refund cheque vide reference no. CMPP7944255 dated May, 5, 2011 sent by speed post No. EW742804113IN returned undelivered because I was out of Ranchi due to illness of my daughter at Guwahati. Sir, after that I have so many times visited Income Tax Office, Ranchi but all the times I have informed that my case is under process and till date I have not received my refund. Sir, I am a retired person and facing difficulties. My wife is suffering from acute heart disease and I am in urgent need of money. For this act of your kindness I shall ever remain grateful to you. I am Md Rezual Haque. I have submitted my return for the assessment year 2011-2012 before last date. As I am eligible for refund but I have not received the same. You are kindly requested to check the same and arrange my payment for which I'll be ever thankful to you. Dear Sir/madam, My name is Basudeb Gain, My PAN no is AMGPG7224G. I would like to inform you that I received my Returned Cheque from your office for the assessment year 2011-2012. But in this Cheque my Bank a/c number is wrong. My actual Banker is BANK OF INDIA, HARISH MUKHERJEE ROAD BRANCH. A/C NO- 404010110001388 and MICR code no- 700013024 , IFSC CODE: BKID0004040. i post my original cheque and bank proof (cancel cheque) to. Sir I shall be highly obliged if you kindly rectify the above mentioned matter and issue a fresh Cheque in favour of me as early as possible. i send this application on date 29 th oct 2012. Dear Sir, I Mrs. Parvathy. My Pan No. is APFPP9497N. Till today I did not get my 2008-2009 TDS return. Kindly help me to get the same as early as possible. For 2010-2011 year I have to get 3000 amount form the IT return refund team still I am waiting for amount. I am checking status in google always it is showing as "Your assessing officer has not sent this refund to Refund Banker". Please can you make it done fastly. My Pan No is AADPS5005Q, I have not received my I T Refund due for the Assessment Year 2009-10,Kindly expedite.Thank you. I need assistance for the payment of refund for A Y 2009-10.My Pan No is AADPS500SQ. My pan no is BYGPS1824P, My return filed on 24/10/2011, for A/Y 2010-11, But up to now I have not received my refund, so please check & send me immediately.my date of birth 18/02/1980. My pan no is AHAPT0240N, My return filed on 04/01/2010 asst yr- 2009-2010, But still i have not recieved my refund, So request to plz check and upadte me if any problem my date of birth 15/03/1986 and my email id is rakeshrkpl@gmail.com. My Income Tax Returns for the AY-2008-2009,2009-2010 & 2012-2013 have yet been processed/assessed. Causing which my refund pertaining to AY-2012-2013 has not yet been released. You are requested to look into the matter and expedite above refund at the earliest. My PAN N0. is AJCPS8521P DOB; 20-06-1950 Name Umesh chandra srivastava. My returns filed for AY- 2009-2010,2010-2011 and E return for 2012-2013 have not yet been processed/ assessed. Causing which the refund relating to AY-2012-2013 has not yet been received. Please look into the matter and expedite above refund at your earliest. My pan no is AJWPV2535L , Name : A.Varadharaj, TDS Return filed on 15/07/2013, for A/Y 2013-14, But up to now I have not received my refund, so please check & send me immediately.my date of birth 28/03/1974. E-filing acknowledgement No.656508490150713. National electronic clearing system in simple words direct transfer in your bank account. I have pending refund for FY 2009-2010. I tried to find refund status by filling my PAN & AY year in the box provided in this article. But clicking on Submit does not work. What mistake am I making? My FY 2009-2010 IT Return was filed when I was at Delhi. My PAN still has Delhi address. Now I have moved to Bangalore. If I change my address in PAN, can it create some problem for pending refund for FY 2009-10? If yes, how to handle the situation? Now I want to change my address in PAN to my Bangalore address & file next IT Return at Bangalore. Kindly suggest. Thanks. I checked & it is working. people are facing same problem as I am for FY 2009-10 etc. Is it because ITRs were filed manually? Kindly suggest what action is needed from our side to get the refund? Also, will moving PAN address from Delhi to Bangalore may create more problems for the pending refund? You should write a letter to your old AO and ask him status of your refund ,if already issued but not encashed then ask him to send it on new address. How can I find postal & E-mail address of old AO (Circle 31(1) New Delhi)? some problem? If yes, will it be better to change address in PAN only after refund is settled? Sorry. I needed details on Circle 52(1) instead of 61(1). Are details available? If yes, kindly semd. 'Check your tax refund status' is very useful & short cut route to get instant details about refund.Thanks a lot & also for your daily tax related dose by mail,which is also very useful. 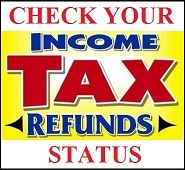 Check by Income Tax Refund Status, It's is helpful for you.